Inofia 8 Inch Hybrid Foam Spring Mattress is selling on Amazon. I think the price is very good. Please read some of the reviews and see what people thought of the product. Do check how you might qualify for a free shipping offer if available. ◆Inofia Double Mattress (queen size): with Perfect 3D knitted fabric, making the surface comfortable and breathable. 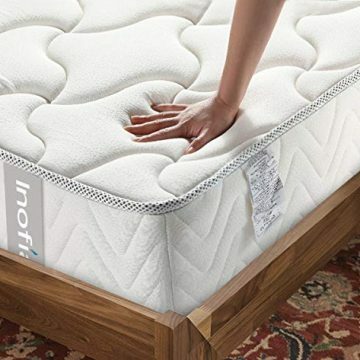 A 1.4-Inch layer of high-density hybrid foam beneath the quilted top layer helps to minimize pressure points, wrapped 6.5-inch pocket coils move independently reducing the sensation of movement and providing undisturbed rest and relaxation. ◆ 8 Inch Spring Queen Mattress: with High-Density Hybrid Foam and Medium Firm Temperature Neutral, Motion Isolating. This is a Quality Queen size mattress that comes with a fire resistant polyester barrier that meets flammability standards and keep your family safe. Professionally hypo-allergenic treatment reduces moisture and dust-mite allergen inside the mattress for a healthier sleep. ◆Pocketed Coil Innerspring Mattress :The high quality carbon steel spring coil are highly flexible and provide excellent tailored support for your bone system. Tempered by heat treatment can prevent rust and deformation for great durability. ◆Smart Shipment: Our mattress ships compressed, rolled and shipped in a box conveniently delivered to your door for easy set-up. Recovery of 72 hours is recommended for your new mattress to achieve its original, plush shape and dissipate the smell. ◆INOFIA GUARANTEE: Created to provide luxury at an affordable price. This QUEEN mattress measures 80-Inch x 60-Inch and comes with the 100-day full refund guarantee and 2-year warranty for your worry-free order.Attention:The mattress may be soft for people over 200 pounds.